‘Brutti ma Buoni’ is a commissioned work by Hotel Hotel which seeks to build knowledge and appreciation of Brutalist architecture in Canberra. The work consists of two parts- a short film of Brutalist buildings in Canberra, co-directed by Coco & Maximilian and U-P; and an accompanying score by Speak Percussion that interprets them aurally. Together they observe and orchestrally arrange Brutalism. The screening and performance work together to create a different experience of Brutalism – one that doesn’t ask us what we think, but rather, one that asks us to feel and question Brutalist architecture with our senses. What can we see when we really look at these monolithic structures in detail? When holding our gaze what do their rough textures, shadows and unadorned geometries reveal? What might these beasts sound like? Cavernous and vast? Drone-like? Repetitive? Hypnotic? Oppressive, optimistic or sublime? 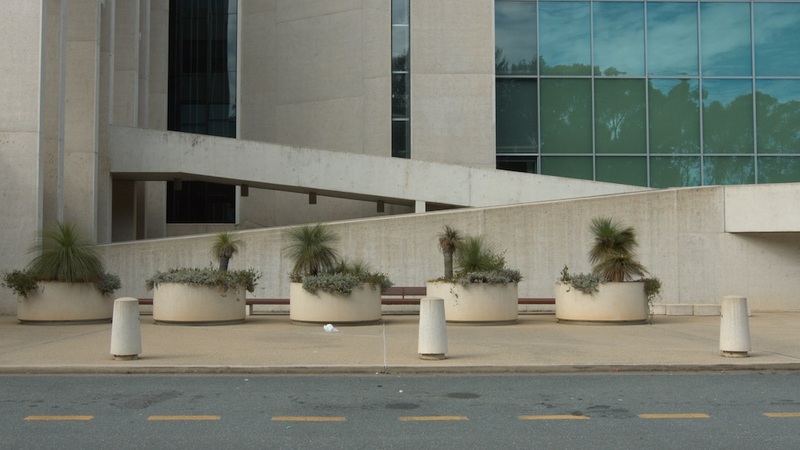 This is the first screening and performance of ‘Brutti ma Buoni’ in Canberra – Australia’s home of Brutalism. Monster kitchen and bar will be running a cash bar serving up Brutalist influenced drinks before and after the performance. ‘Brutti ma Buoni’ features the interiors and exteriors of some of Canberra’s most notable Brutalist buildings including Llewellyn Hall, National Gallery of Australia, National Carillon, High Court of Australia, University of Canberra Village, and Black Mountain Library. Free event. But you need to RSVP here.